Try our 3-step method for simple homemade meatballs. All you need is ground beef, bread crumbs, barbecue sauce, eggs and Parmesan plus 15 minutes of prep and you'll be Mastering the Meatball in no time! Roll into 48 balls, each about 1 inch in diameter; place on rimmed baking sheet sprayed with cooking spray. 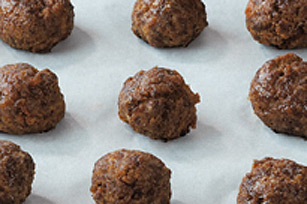 Place meatballs in single layer in resealable plastic bags. Lay bags flat on trays, then freeze. Meatballs will freeze individually for easy separation. Meatballs can be stored in freezer up to 2 months. Thaw in refrigerator several hours or overnight before using. Divide meat mixture into 8 equal portions. Roll each portion into long cylinder, then cut into 6 equal portions. Roll each portion into a ball, then continue as directed.